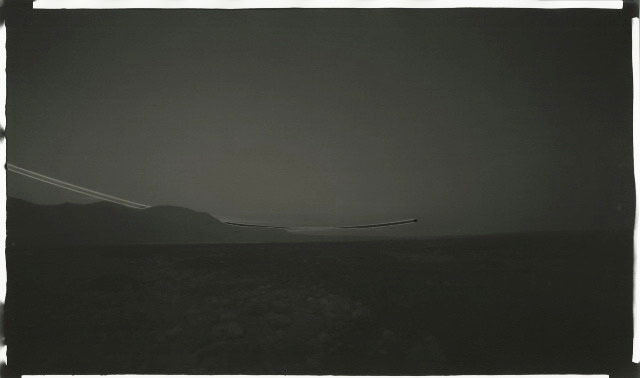 Chris McCaw doesn’t need a light meter or even a look through the lens of his hand-crafted view cameras to know if a picture is correctly exposed. When smoke starts wafting from the bellows he knows a picture is ready. 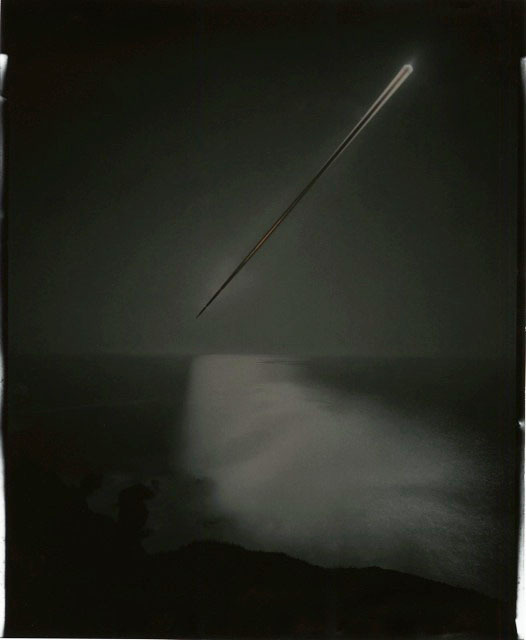 “It smells like marshmallows roasting,” says the SF-based artist of the “cooked” photo papers that comprise Ride into the Sun, an exhibition of unique gelatin silver negatives made at locations throughout the West. His scorched prints show the sun literally burning a path across wide-open expanses of desert, sea tundra and sky. That his pictures recall the early days of the medium, when artist/chemist/inventors revolutionized science and seeing, is no accident. McCaw, 40, seeks to extend that pioneering tradition by exploring possibilities that photography’s originators surely glimpsed, but for whatever reasons, declined to pursue. His method is a highly sophisticated variant of the old boy scout trick of starting a fire with a magnifying glass. He leaves the camera shutter open for long periods, recording the arc of the sun across the sky while retaining only the faint outlines of the landscape below. What enables this difficult feat is solarization, a bit of alchemy that reverses normal tonal relationships, allowing McCaw to capture far more information than would normally be registered on a piece of overexposed film or photo paper. The first images of his that I saw in 2010 reminded me of tanned animal hides that had been subjected to a blowtorch. The holes ranged in size from tiny pin-prick “apertures” to lengthy cuts. The longest, which flare out like the slashes in Lucio Fontana’s paintings, present a visceral, material record of the event taking place before the camera. On a clear day, the movement of sun shows up as a black incision. If it’s rainy or overcast, it can appear in shades that range from white to smudgy grey. While the sky in most of his pictures is typically lighter in tonality, it, too, can appear singed to near blackness, depending on the weather and what bits of information the artist decides to emphasize or withhold during processing. For the most part, everything else — mountains, sand and water – glows in luminous, spectral shades of grey, like a film-based photo made at dawn or dusk. The result is a kind of avant guard Pictorialism, one in which the tonal gradations of the standard gelatin silver print are brutally interrupted by an act of nature that feels foreign to the photographic process, yet, in point of fact, is absolutely essential: light. McCaw uses it to invert the relationship between the familiar and the strange, making the pared-down features of landscape appear strange, while making the one element that is truly otherworldly, the sun, appear matter-of-fact. “What’s great about this,” says the artist speaking from his San Francisco studio, “is that it’s so completely grounded in the natural world. It’s just a piece glass and a lens cap; it’s simple and it’s primal. “You can tell” – if you have a knack for celestial navigation – “by the angle of the sun what season it is and where I am on the planet.” In full-day, multi-panel exposures made in Alaska, the Sierras and Puget Sound, for example, the line etched by sun is concave, bowl-shaped. Single-frame exposures of considerably shorter duration, made in the Mojave Desert, show the sun as bold streaks, like comets or shooting stars. In other places, like the north slope of Alaska, the sun’s arc is convex: upside down. In one stunning, 14-panel shot made over 24 hours there, the sun moves like a roller coaster across the horizon. While the multi-panel pictures have an undeniable epic quality, the most dramatic pictures, at least to my eye, are the long exposures made on a single sheet. GSP#420, taken in the Arctic Circle, shows the sun streaking behind a mountain range; its line looks like an exhaust trail spewed by a jet. Few analogs in either contemporary or historic photography exist. The closest is the oldest, done by photography’s inventor, Nicéphore Niépce in 1812. Using a camera obscura and an 8-hour exposure to illuminate a building, he charted the movement of the sun by recording on paper opposing shadows cast by the sun at different times of day, thereby encapsulating in a single frame the experience of time. In the latter part of the century, Eadweard Muybridge, did the same with sets of synchronized cameras and film-like montages that demonstrated facts about human and animal movement that had long eluded the naked eye. Today long exposures of the night sky, of “star trails”, are an all-too familiar cliché. As for the movement of the sun, astronomy unveiled most of the pertinent facts long before photography was invented; yet I know of no photographs that track the sun’s movement in the manner of McCaw’s. Like so many discoveries in photography, McCaw arrived at his by accident. He overslept during an overnight exposure and woke to find his film scorched. He thought about tossing the negative, but instead he printed it and kept going. Eventually, he decided that what he needed was a more direct method of image making. He dispensed with film negatives and began directly exposing vintage photo papers, discovering, through trial and error, a select number of now-defunct products that gave him the results he was seeking. It’s “a Herculean effort” making pictures this way says the artist. 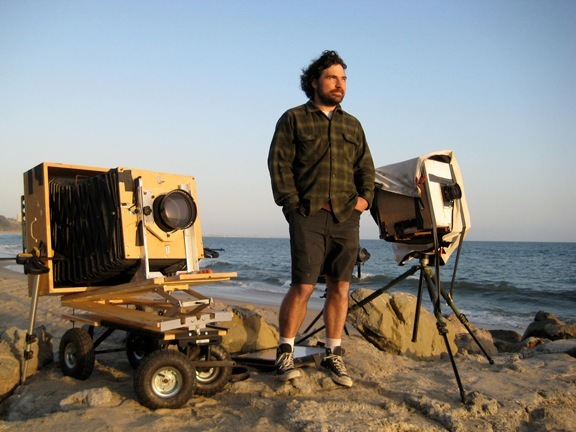 For openers, McCaw, who’s been photographing since he was 13, builds his own cameras. They’re simple (“no kiln-dried mahogany, no brass fittings”) machines ranging in size from an 8 x 10 camera outfitted with a 600mm lens that requires a car jack to raise and lower to a 30 x 40-inch box equipped with 48-inch military lens that weighs 125 pounds. They’re mounted, respectively, on a wheelchair and a garden wagon — innovations that he says were inspired by his grandfather, a Central Valley farmer who’d hitch car engines to crude mounts to make saws. Though he works from the relative comfort of a van and travels paved roads (as opposed to driving mules across mountains with fragile glass plates in tow) he still faces many of the same challenges as his 19th century counterparts — namely, heat, cold, insects, animals and, most of all, the vagaries of weather. Says McCaw: “I’m physically working with light,” meaning that extended periods of rain, cloudiness or snow can ruin a picture. Earlier this year in Alaska, when he was making 24-hour exposures, “I’d be 17 hours in and it would start snowing. I had tarps by the camera, so if it cleared up before the sun left the frame I could keep going; but if it clouded up I was screwed. It’s definitely an exercise in patience.” Timing is critical, too. During all-day exposures, when it was easy to nod off or be distracted by reading or sketching, McCaw had between three and 10 minutes after the sun left the frame to change papers, realign his cameras and secure the wheels of his movable supports to prevent the cameras from being knocked about by the wind. Chris McCaw: “Ride into the Sun” @ Stephen Wirtz through Dec. 22, 2011.